The fact that the Christian claim can be verified strikes many as impossible, and the desire to verify it seems presumptuous. And yet, how are we expected to accept it, and more, to be prepared to lose our lives for it? Some say that in matters of faith we accept what is proclaimed by recognizing the authority of the source. The problem with this is that it merely shifts the focus to another question: How do I verify the credibility of this authority? The Christian claim is the Incarnation; the Mystery that we call God, the source and destiny of our existence, the meaning and purpose of all that exists, the reason for which anything has worth, has entered human history and revealed Himself in and through the humanity of the concrete man, Jesus of Nazareth. This is the claim. How can we verify such a claim? To do so, I must look within history itself for something that was not there before Jesus was conceived, and that has remained present since then in spite of His Death on the Cross. It must be something extraordinary, of “another world” but present in this world. What has Jesus brought into this world that would not be within it if the Incarnation had not taken place? Pope Benedict XVI has publicly asked and answered this question numerous times, realizing that everything else we might have to say as followers of Christ depends on it. It’s amazing, but after 2,000 years of Christianity we are facing a question that, one would think, belongs to the beginning of Christian history, when no one had heard about any claim of or about Jesus. 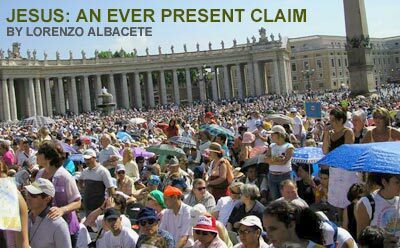 The fact that the Pope is asking this question tells us that Péguy was right, that we are in a period of history never known before: a time in which the claim of Jesus has been removed from the world and must be proclaimed and defended as if it were the first time the Christian claim has been made in history. Consider the absolutely remarkable words of the Pope to the Latin American bishops last May: “What does Christ actually give us? Why do we want to be disciples of Christ?” The Pope replied that Christ gives us the true life, which is the only life that is really worth living. Then he asks bluntly, “But is it really so?” How do we know that living the Christian life is not, in fact, living an illusion? The Pope’s answer is that illusion is precisely that from which Christ saves us! This is what being saved means. It means being liberated from illusions and empowered to live life as it is meant to be, a life that corresponds to reality. When Christ is removed from this world, this is what happens: we lose contact with reality, we do violence to reality. But how is it that Christ reveals to us what is real and rescues us from destructive illusions? Christ reveals what is real by revealing God, by being the Presence of God in the flesh, the God that shares our humanity so that, sharing His divinity, we might finally be what we were meant to be from the beginning of our existence. Christ and reality are inseparable. The Christian life, sharing the life of Christ, is not optional to what creation is all about. Life “in Christ” is the only true, real life there is. In the words of the Pope: “If we do not know God in and with Christ, all of reality is transformed into an indecipherable enigma; there is no way, and without a way, there is neither life nor truth. This is what is at stake today. This is why the Church insists on the need for a “new” evangelization. Still, how do we verify the truth of this claim? There is only one way: by experience, by being physically present where Christ is claimed to be and experiencing reality as we had not seen it before. Such is the life of the Church, the life that is the Church! This is how we contribute to the future of this world, by building the Church as the home of the heart. This article originally appeared in Traces, the magazine of Communion & Liberation. Reprinted with permission. ©2007, Traces Magazine. All rights reserved.